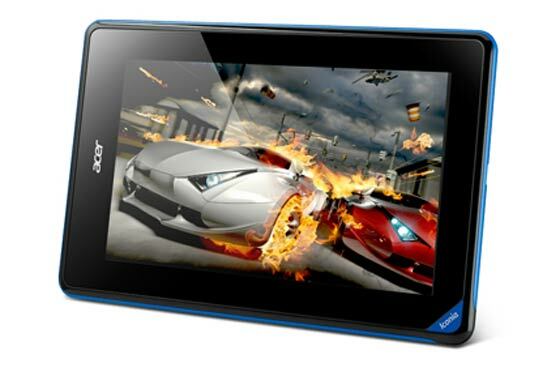 I wrote about the Acer Iconia B1 entry-level tablet on Christmas Eve. The WSJ had tipped us off that this new, as-yet-unannounced, 7-inch Android tablet would be aimed at the magical sub US$100 price point. That’s £62 in real money. However according to a number of sources including Android Central and Engadget, the new budget Acer B1 tablet is going to launch at £99 or US$150. The Acer Iconia B1 is set to become available at the end of this month and Android Central has been given a price of £99 for UK folk. Hopefully that includes the 20 per cent VAT. Savvy UK shoppers will be able to get these cheaper using discounts, vouchers and cash-back shortly after its launch. I remember the WSJ referring to this Acer Iconia B1 as being aimed at “emerging markets”. Engadget states in its report that the B1 won’t be sold in the US but most sources confirm it for UK release at the end of this month. US$99 is a hard price to reach for something like that! Pretty low-end tablet though - 512MB RAM is especially limiting. You are better off getting a Playbook (and installing Android apps on it) IMO, the hardware and build quality is going to be a lot better. No, the PC Pro article says the reverse, it uses an TN panel, not the higher quality IPS ones. I dont think anyone has ever claimed TN panels are high quality, at least not in recent years.